The proliferation of smoothie bars is just a sign of the times: a more health-conscious society is in search for places where a treat can be enjoyed free of guilt. 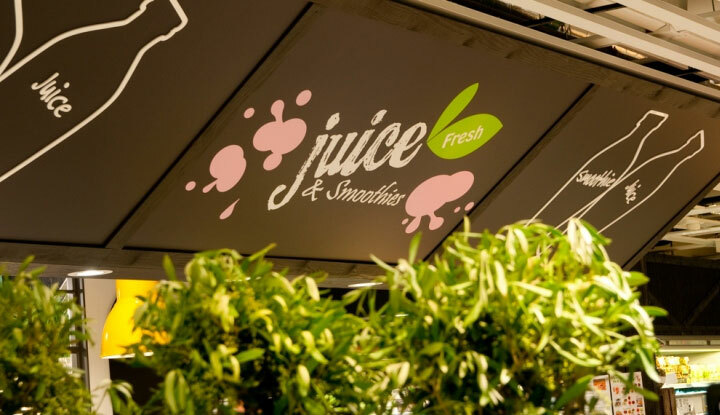 Such a place is the smoothie bar created by IDEI Concept ID, a Stockholm-based design and production agency. 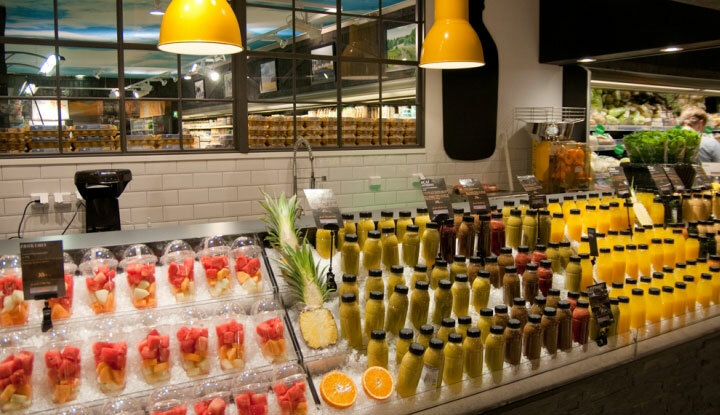 The smoothie bar, located in ICA Liljeholmen, one of the largest supermarkets of the Swedish capital, is a feast for the eye and a definite temptation. Born out of a need and desire to reduce produce waste within the grocery store, the smoothie bar checks more than this one box. 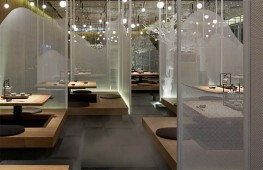 It allows patrons to take a break during shopping and continue on with new energy after tasting the refreshments. It is an excellent advertisement for healthy eating. It adds something to the aesthetics of the grocery store. When designing the smoothie bar, the idea was to create a space built around the good feeling people have looking at ripe, sun-kissed fruit. In fact, this sunny vibe is obvious as soon as patrons approach the bar. 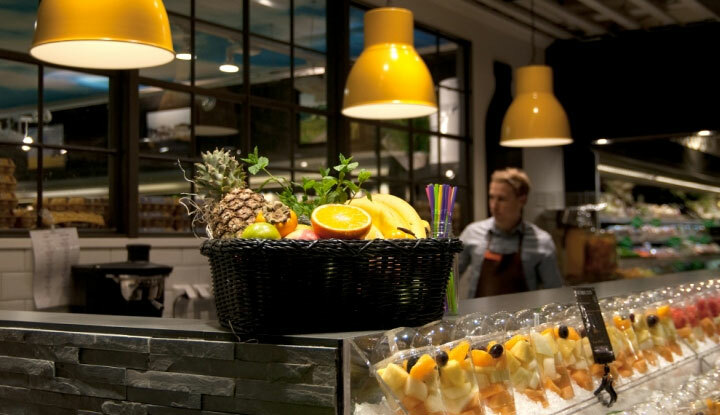 The bright yellow found in both the fruit display and in some elements of decor makes the eye happy and attracts the curious. 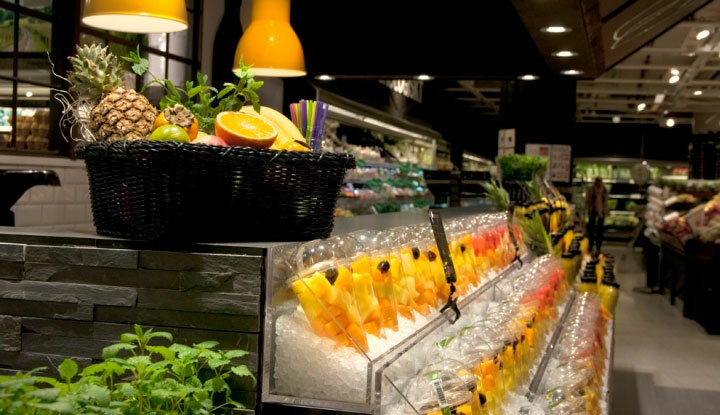 Fruits and their colors play the central role in the design of the bar. It is a smart strategy, since humans have an inherent sensibility for all that speaks of nature, and are attracted to images of abundance that promise satiety and happiness. What designers did was to create a backstage for displaying both their raw and final produce, keeping this background simple and completing the space with elements in accord with these colors. The stone sides of the counter bring to mind the flow of fresh water springs and offer an earthy-looking stage for fruits and herbs. 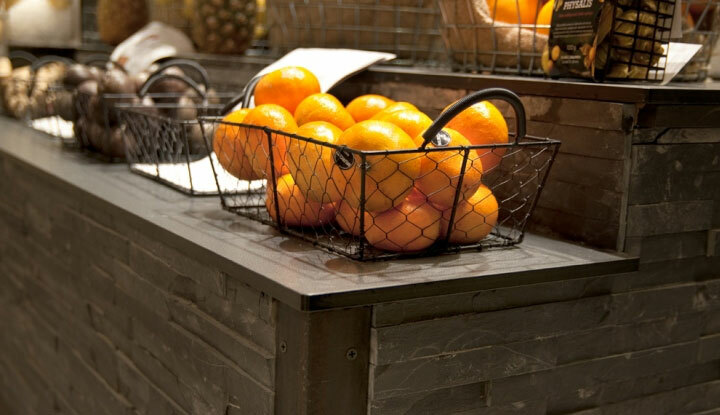 Simple wood and metal baskets suggest the freshness of just-picked fruit. 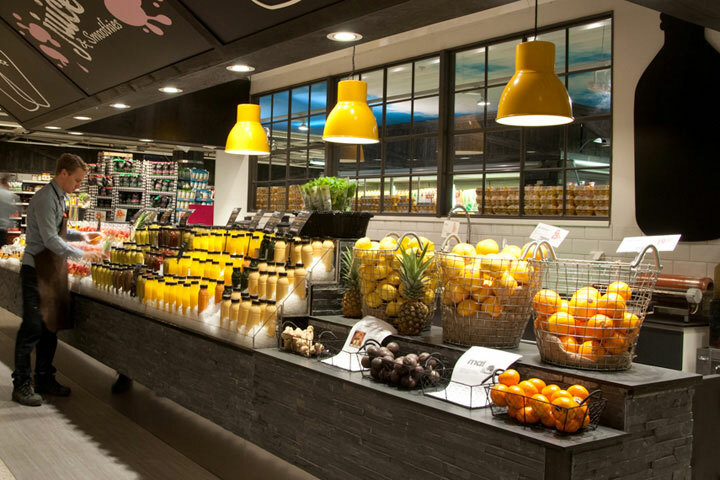 Large yellow lamps continue the chromatic scheme drawing the eye upwards end evoking both the sunlight and the citrus fruit – the very image of freshness. 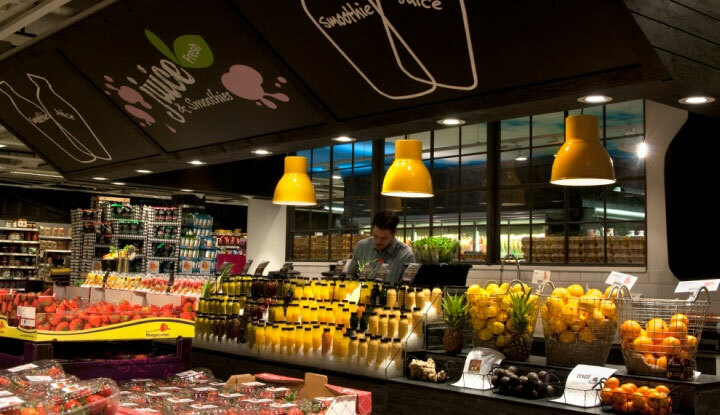 Above the smoothie bar, oversized stylized drawings of bottles attract the attention of patrons without overwhelming the earthy, simple design of the bar. It is not easy to resist the temptation of using this smoothie bar – and not in the least necessary.